A post-Cold War development, the Italian Ariete main battle tank (MBT) employs the latest optical and weapons systems, giving the tank similar capabilities as other modern MBTs. Smoke grenade dischargers are mounted on either side of the turret, providing the Ariete with another tool against antitank weapons in urban combat. For further protection, the tank is equipped with enhanced side armor and the RALM laser warning receiver. 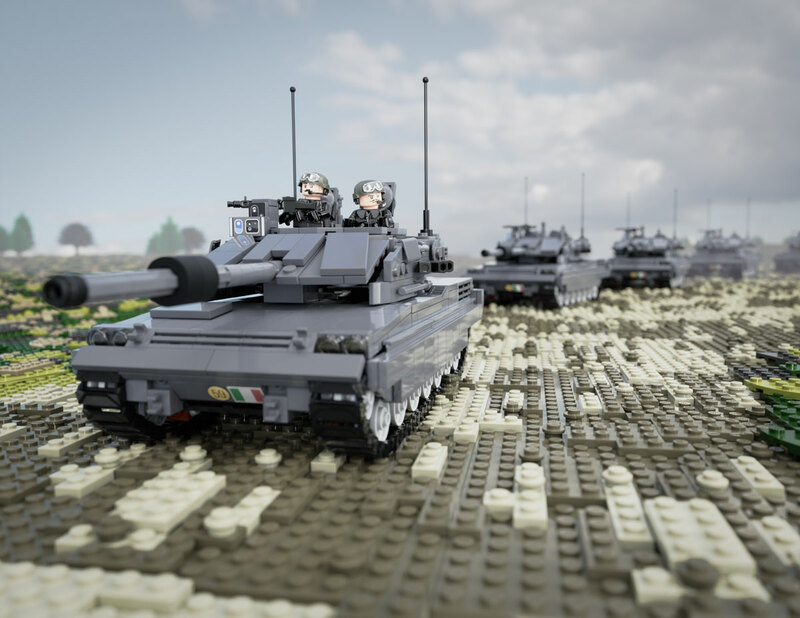 The Brickmania Ariete kit includes the fine details and sleek design of the modern day tank. Key components include a rotating turret and elevating main gun, working Brickmania Track Links, opening hatches, a high-quality sticker sheet, and printed tiles. Also included is a custom Italian Tanker minifigure and BrickArms MG42 and ammo box. For those long road trips, the kit comes with military rations in the form of a “Slamarino” bottle of sparkling mineral water and “Canepa” brand olives.